In a few hours, Bret Baier and fellow co-moderators Megyn Kelly and Chris Wallace will question a field of candidates that is down to four. 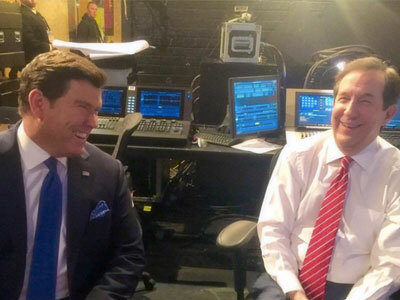 In the lead-up, along with the usual prep and rounds of interview, Baier has been doing some social media work, stocking his Instagram feed with behind-the-scenes photos of the debate space, Detroit’s Fox Theater, as well as pics of himself and fellow moderators. Baier’s social captures are part of a debate partnership between Fox News and Instagram. Yesterday, Baier was featured on Instagram’s official blog, and today some of Fox News’ photojournalists are tasked with covering the debate for Instagram, with their photos and videos appearing in a section of Instagram’s Explore tab. Check out some of Baier’s pics below. Good morning and happy #gopdebate day from the (appropriately) named #Fox Theatre in #Detroit. I'm ready to start the day with Megyn and Chris for final debate prep. See you tonight at 6pmET for #SpecialReport and 9pmET for the @foxnews debate.